Smarter Travel is a TripAdvisor company that owns and operates leading consumer travel brands, including BookingBuddy.com, AirfareWatchdog, and more. 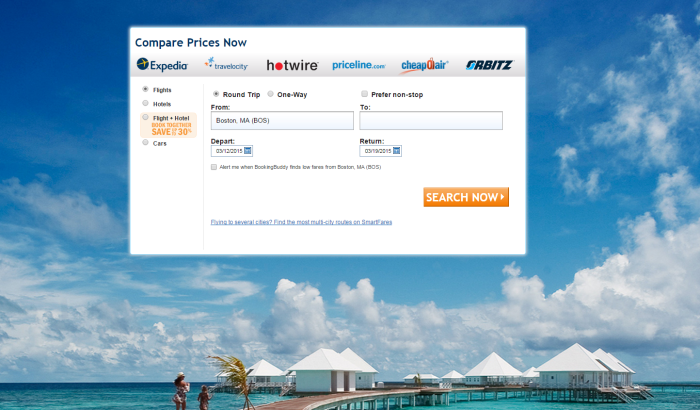 Travelers use Smarter Travel’s web properties to hunt for the best deals when planning upcoming trips. For Smarter Travel, experience optimization plays perfectly into their company motto: speed wins. The speed at which Smarter Travel was able to implement Optimizely, ramp up the team, and then build and run tests has been hugely impactful in generating long-term gains and bookings, and increasing the company’s bottom line revenue. Today, the team runs, on average, a total of 30 campaigns per month. The velocity at which they are able to test, optimize, and iterate has been critical to their success. The Smarter Travel team noticed a problem with one of their most important pay per click landing pages, which serves as an entry point to BookingBuddy.com. Original Smarter Travel pay per click landing page. Once a visitor landed on that PPC landing page, the goal was for them to fill out a search form and enter into BookingBuddy.com’s booking funnel. User testing showed a high percentage of visitors landing on that page were not converting, and after the team dug in further using analytics, they noticed the problem was even more significant. They decided to run a series of tests to increase conversions on the page. The variation of the Smarter Travel pay per click landing page. The original landing page experience was stark. The team hypothesized that building a more visual look and feel would increase search conversions because it would attract more eyeballs and engage users more effectively. When it was all said and done, the team ran eight total tests on the landing page over the course of a month, optimizing different aspects such as the page headline, partner logos, background images, form fields, and more. The results of their month of optimization on the landing page made a tremendous impact on Smarter Travel's bottom line revenue. With a higher converting page and data to back them up, the team pushed for more budget to invest in display ads, sending traffic to the optimized BookingBuddy.com landing page. With more traffic hitting a better performing page, the impact this series of tests had on Smarter Travel’s bottom line revenue grew even further. Not only did they boost revenue from improved conversions on the landing page, they were also able to proportionately increase the amount of business driven through search. Overall, these changes resulted in doubled revenue per visitor from the BookingBuddy.com landing page. Taking an iterative approach to testing, and being able to test and implement the optimized experience so quickly, helped Smarter Travel reap enormous benefits and have a greater impact. Getting up and running fast was key to Smarter Travel's experience optimization success – and was made easy with Optimizely. From day one, the team were able to build and run multiple optimization campaigns on a weekly basis. After getting everyone trained on the product, they quickly moved from 2-3 campaigns per week to 5-6 campaigns per week, in just their first month. Today, they average 30+ campaigns per month. 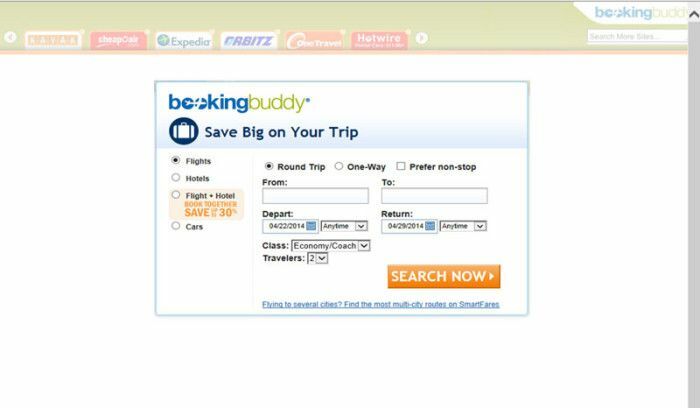 Rather than taking a “one and done” approach, Smarter Travel tested multiple elements of the BookingBuddy.com landing page to drive the greatest impact. By focusing on several key elements, rather than just one test, the team was able to double revenue. There’s a sign on my door: Speed wins. It’s the informal internal motto and was handwritten by me 10 years ago, and as the office has moved so has the sign.